Jozi Stars finish second and book a play-off spot at home. Despite losing, the Spartans are still in the run to secure a third-place finish with Paarl Rocks, and Nelson Mandela Bay Giants also fighting for that all important final qualification spot for the play-offs. One of the three teams will face the Stars on Friday. In the event of a three-way tie on 21 points between Nelson Mandela Bay Giants, Paarl Rocks and Tshwane Spartans, then the Spartans will finish third as they have won both games between themselves and the Paarl Rocks and both of these teams will have more wins than Nelson Mandela Bay Giants. The Stars were shinning bright on the night as they got off to a dream start in defence of 239-3 with Beuran Hendricks, Duanne Olivier, Kagiso Rabada striking inside the powerplay to remove Andrea Agathangelou 10 (7) Dean Elgar 7 (7), and the big fish, Ab de Villiers 0(2) respectively leave the Tshwane Spartans struggling at 44-3 after 6 overs. The men from Tshwane further lost two more wickets of Corbin Bosch and the dangerous Eion Morgan at the hands of Pongolo who took 6-20 which is now the best bowling figures in the tournament. Gihahn Cloete was fighting a battle with a well-played half-century. Tony de Zorzi 33 (26) and Morgan 27 (12) were the other two batsmen to make a meaningful contribution to the Spartans’ chase that never really materialised. The Atmosphere was electrifying at the Bullring. 5739 spectators came out in their numbers to support the stars. That figure is the highest number of fans for the Jozi Stars home game fixture in the MSLT20. The figure is impressive for a Tuesday night game. Earlier on the Stars lost Reeza Hendricks 20 (17) and Ryan Rickleton 45 (30) who replaced Chris Gayle inside the firs 10 overs after winning the toss and electing to bat first. Kagiso Rabada who was hitting balls in the nets prior the match, walked in to bat number four to the surprise of many but played a decent innings of 21 (11). 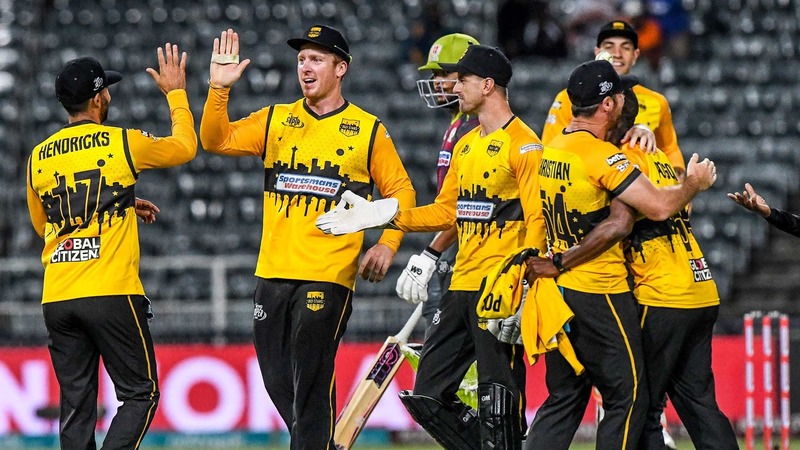 That was all the success the Tshwane Spartans bowlers had with the ball as Dan Christian and Rassie van der Dussen turned things around with their outstanding power hitting sending Tshwane Spartans bowlers to the cleaners all night long. Christian and Van Der Dussen shared a partnership of 118 in just 43 balls with the Australian big hitter scoring the fasted 50 of the tournaments, 18 balls. Van Der Dussen needed to hit a six of the final ball of the innings to reach his fourth T20 century but missed to end on 96 of 44 balls to help the Stars post the highest total in the tournament of 239-3 in 20 overs beating their previous best of 230-3 against the Durban Heat. The Tshwane Spartans bowling figures were looking all rather disturbing with Robbie Frylinck(1-55), Corbin Bosch (1-54), Lutho Sipamla (0-47), and Shaun Von Berg (0-44) in their four overs. The Stars will have to wait until the 12th of December to find out who they will be facing in the qualifier on Friday.